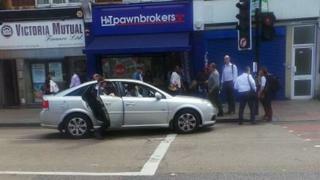 The Metropolitan Police Commissioner interrupted a BBC radio interview to jump into a taxi and make an arrest. Sir Bernard Hogan-Howe was near Bruce Grove station in Tottenham, north London, when a cab driver said his passengers had refused to pay the fare and stolen money from his dashboard. Sir Bernard jumped into the minicab in pursuit and arrested a suspect some distance away. The Met Police said a 19-year-old man was arrested on suspicion of theft. Sir Bernard was taking part in a pre-recorded interview with BBC London 94.9 Drivetime presenter Eddie Nestor on the issue of cuts at about 11:30 BST when the minicab driver approached him. The Met Police said "four males were seen to jump out of the vehicle and run off" and the Commissioner and an officer got into the minicab in pursuit. Media captionMet Commissioner said he has "made an arrest at every rank as a police officer"
A 17-year-old youth was arrested inside Bruce Grove station on suspicion of theft, handling and making off without payment. The officers then left the taxi and got into a police car that arrived there, before embarking on their search for the three other suspects. One of them, aged 19, was seen in nearby Napier Road and subsequently arrested on suspicion of theft and making off without payment. Both arrested men are in police custody. Speaking to BBC London 94.9, the driver, who gave his name as Mohammed, said he had picked up some people from a hotel in Chingford and was asked to drive them to a location but one of the passengers asked to be taken to Stamford Hill instead. He claimed the passenger then took £20 from his dashboard and ran away. "When I see the police, I ask the police 'Please can you stop the guys?" he said. Asked whether he knew the officer who jumped into his cab was the head of the Met Police, the driver said "no", but added: "He's very good man, very kind man, he help us as well... he come sit in the car and searched the area as well." After the pursuit and arrest in Tottenham earlier, the commissioner said: "The important thing for today, at least for me, is that I have made an arrest at every rank as a police officer, so as chief constable at Merseyside, but never as commissioner, and I have been here three years. "That's very slack, it's a disgrace, but today we have put it right." In 2006, when Sir Bernard was the chief constable of Merseyside, he sprinted after a suspected drink-driver in the Edge Lane area of Liverpool after spotting him from his chauffeur-driven car. The officer ran after the man and arrested him. The Met Police said a 47-year-old man who attended a north London police station to "act as an appropriate adult" for the 17-year-old who was arrested on suspicion of theft from a motor vehicle earlier in the day, was himself arrested. Police found the adult was wanted on suspicion of theft over a separate offence.